Many thanks to Dominique Bourassa for transforming these documents into Drupal, the members of the Books+ Search Analysis Working Group for their work on documenting the Quicksearch Solr indexes, and attendees of SearchFest for informing this documentation through their presentations and questions! Morris Holdings now available in Quicksearch! Morris holdings now appear in Quicksearch! 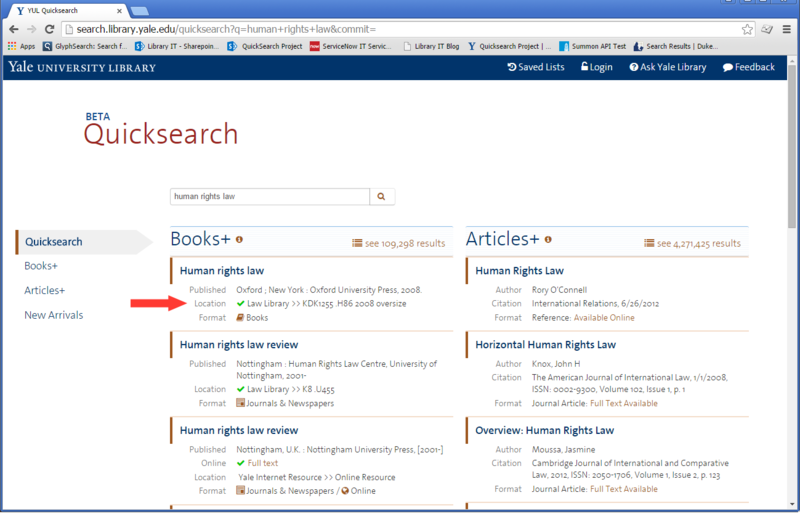 The best way to view this new feature is to search for a law-related topic like ‘Human Rights Law’ in Quicksearch: http://search.library.yale.edu. In the Search Results list you can now see real-time availability information. A red ‘x’ appears if the title is checked out, and a green check mark displays if the title is available. In the individual holdings screen, you can see the location, call number, and status of the title pulled directly in real time from Morris. This is an important milestone in the Quicksearch project ; the two Yale Library catalogs, Orbis and Morris, are both now fully represented in Quicksearch. We have greatly improved relevancy ranking for known phrase searches like Journal titles. A typical example of this is a search for the Journal title ‘Nature’ which has long been a source of frustration in Orbis because so many titles in the Library catalog contain that word. A search for ‘Nature’ in Quicksearch now brings the Online version of the Journal up as the first hit in the Catalogs result list! 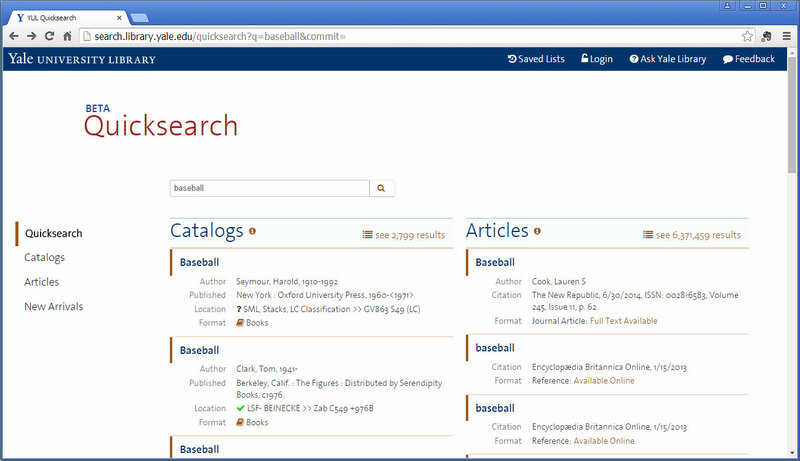 Give it a try: http://search.library.yale.edu/quicksearch?q=nature&commit=. 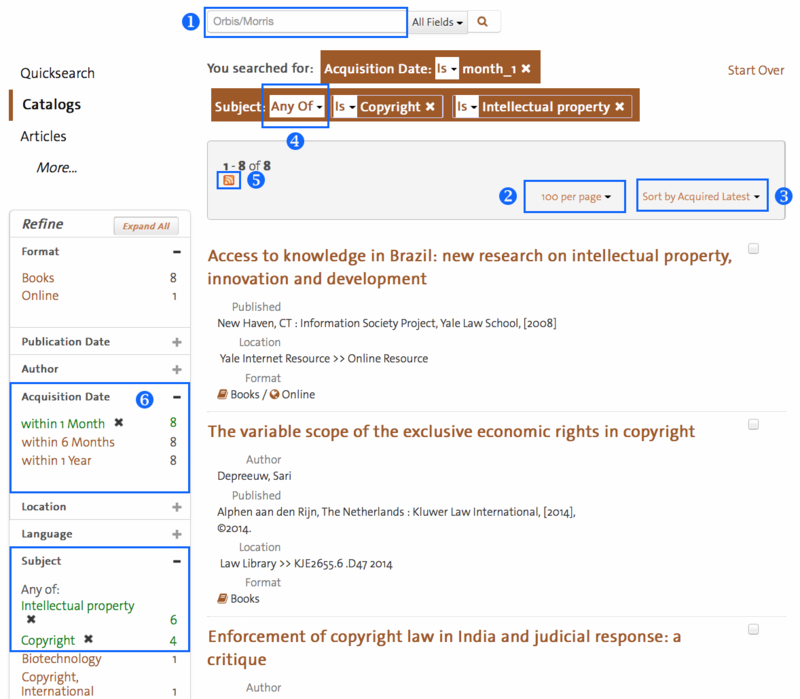 Another great new feature: you can now access Full Text materials like the online version of ‘Nature” directly from the Quicksearch results list. Quicksearch Response time has also been greatly improved! Thanks again to everyone who reported and/or pitched in to help out with this issue. Sign-in with Yale Central Authentication Service (CAS), via the ‘Login’ button, and do a search. Click into either the Catalogs search results or the Articles search results. Check any of the boxes on the right of each item. Hover over the ‘Selected Items…’ drop down and select ‘Save to Bookbag’. Once the item(s) has been saved, you can access your Bookbag by clicking on the ‘Bookbag’ link in the green saved item box, or the ‘Saved Lists’ link in the upper right corner of the screen. 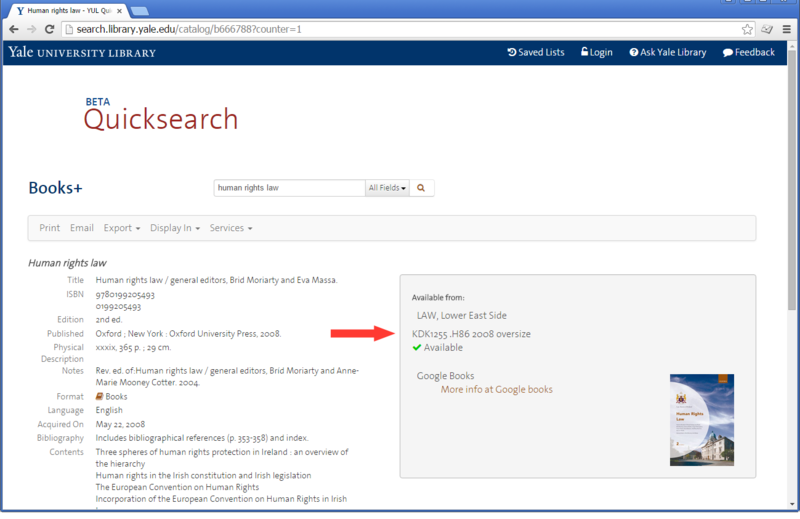 Click on any item in the Catalog results, then click on the ‘Save to Bookbag’ link in the record view. Once the item has been saved to Bookbag, you can access your Bookbag by clicking on the ‘Bookbag’ link in the green saved item box, or the ‘Saved Lists’ link in the upper right corner of the screen. Go inside your bookbag and select the items you’d wish to save to an alternate list. Once you’ve selected your item(s), click on the ‘Copy Selected Items…’ button and type in a new name for your selected items. Once you hit the ‘Submit’ button, your new list is shown under the ‘Bookbag’ list on the left hand side of the screen. We hope you enjoy this brand new feature! You can get a list of newly acquired (not necessarily newly published) items that are relevant to you by running a catalog search in Quicksearch. Then apply a limit by Acquisition Date – perhaps “within 1 month.” You can add further limits too – perhaps only by location “Haas Arts Library.” Then choose sort by “Acquired Latest” to see the newest items added to the Quicksearch catalog. You can also adjust how many results display per page (this will also be the number of items sent to the RSS feed). Once you have the search and limits just as you want it, you can bookmark the page or click the orange RSS icon (right under “Previous” in the results header) to open the RSS feed in the program of your choice – for many that will be Outlook, though there are other options. One last tip, not Quicksearch specific, is to replace your keyword search with a subject search – or limit by subject or call number – in order to produce more focused results. If subjects align well with your interest, consider removing the keyword search term altogether. For example, my test search of the past month’s acquisitions found 4 items with the keyword “copyright” and the subjects “copyright” or “intellectual property.” When I removed the keyword from the search, leaving only the “Acquisition Date” and “Subject” limits, I found four more on-point results – eight total, four that didn’t have the keyword “copyright” at all (items in non-English languages, for example). 1. To search only by Library of Congress Subject Heading, leave the keyword search blank, or clear it. 2. This will set the maximum number of items in your RSS feed. 3. This sort will show the newest items acquired at the top of the list. 4. “Any of” these subjects will “or” the terms together, making a larger result set. 5. Here is the RSS icon that give you the feed address for this exact search. 6. Acquisition date limits will keep the list smaller.